Hanoi (VNA) – The Hanoi City People’s Committee signed a Memorandum of Understanding (MoU) on forming friendly and cooperative relations with the administration of the US state of Utah following a dialogue of Hanoi and Utah businesses in Hanoi on August 30. 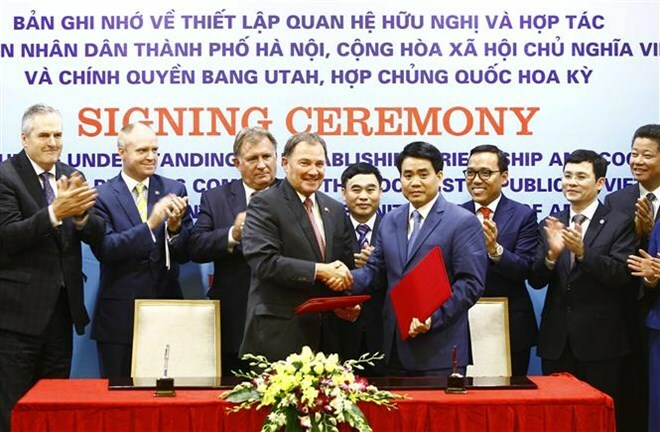 The dialogue, held on the occasion of a visit to Hanoi by Utah Governor Gary Herbert, was attended by representatives from 15 Hanoi enterprises and 25 from Utah. Speaking on the occasion, Chairman of the municipal People’s Committee Nguyen Duc Chung wished that via the MoU signing, the two sides will officially decide on specific cooperative contents and implement them. He mentioned possible fields for cooperation such as general education, personnel training, technological transfer, transport infrastructure, information technology, pharmaceuticals, high-tech agriculture, energy, tourism and environment. The Hanoi authorities pledge all possible support to foreign enterprises on the win-win basis, he said, adding that he hopes the Governor would serve as a bridge promoting Hanoi’s ties with the US administration and businesses and those in Utah in particular. Herbert, for his part, said the Utah administration creates favourable conditions for foreign firms in the state by cutting taxes, simplifying administrative procedures and streamlining apparatus.